When the Berlin Wall fell, people who lived along the dismantled border found their lives drastically and rapidly transformed. Daphne Berdahl, through ongoing ethnographic research in a former East German border village, explores the issues of borders and borderland identities that have accompanied the many transitions since 1990. What happens to identity and personhood, she asks, when a political and economic system collapses overnight? How do people negotiate and manipulate a liminal condition created by the disappearance of a significant frame of reference? 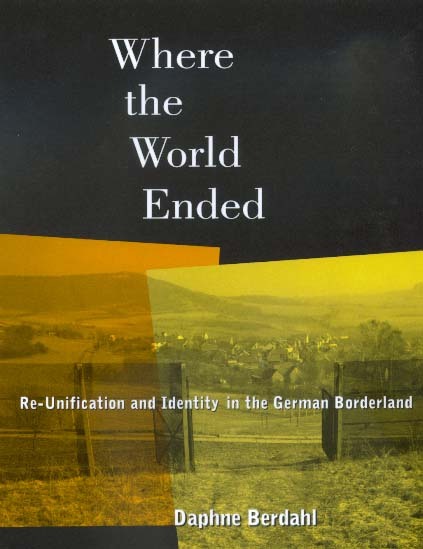 Berdahl concentrates especially on how these changes have affected certain "border zones" of daily life—including social organization, gender, religion, and nationality—in a place where literal, indeed concrete, borders were until recently a very powerful presence. Borders, she argues, are places of ambiguity as well as of intense lucidity; these qualities may in fact be mutually constitutive. She shows how, in a moment of headlong historical transformation, larger political, economic, and social processes are manifested locally and specifically. In the process of a transition between two German states, people have invented, and to some extent ritualized, cultural practices that both reflect and constitute profound identity transformations in a period of intense social discord. Where the World Ended combines a vivid ethnographic account of everyday life under socialist rule and after German reunification with an original investigation of the paradoxical human condition of a borderland. Daphne Berdahl is Assistant Professor of Anthropology at the University of Minnesota.